ONE TWELVE is Hallwalls' newest exhibition space for which submissions are currently being accepted with a DEADLINE of July 31, 2016. 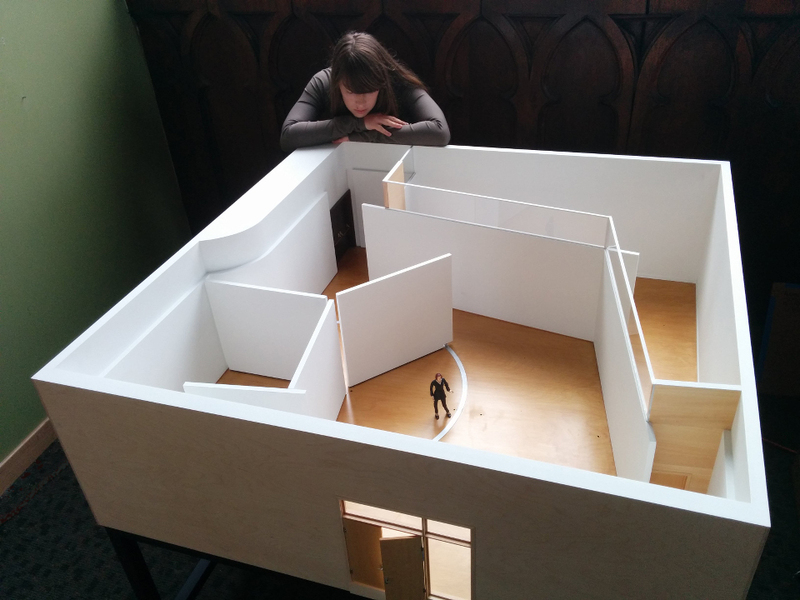 Constructed for Hallwalls at 1/12th scale (1 inch = 1 foot) by artist Patrick Robideau, ONE TWELVE will showcase an ongoing series of "pocket exhibitiions" located within Hallwalls' first floor office and behind the full-scale gallery. All media will be considered, however there ARE limitations. Sitting within a functioning office space, lighting will remain daylight/office lighting and no additional appendages or constructions may be added to ONE TWELVE—it must remain open and viewable from all four sides. Screws, nails, etc are forbidden so works to be adhered by only be done so with tape, museum wax, etc. That said, ONE TWELVE offers opportunites the actual size gallery does not—a sculpture might be installed that exceeds the ceiling height since we've removed the ceiling; the office space in the model also functions as an exhibition space; and works might be installed in such a way that would only be fully viewed in the model version (ie. floor mosaic). The internal non-perimeter walls of ONE TWELVE mimic the movements of the actual walls but are also removable, impossible in our large gallery. ONE TWELVE is realized at "dollhouse scale," but it is emphatically not a toy. It proposes the notion that scale is no hinderance to meaning and that art can function in any context—no matter how adorable. Proposals are expected at a scale that suits the venue - a ONE PAGE PDF. Your proposal may be specific to the scale of the model or you may just want to propose a series of new, smaller versions of your ongoing work. Proposals are accepted globally, but there is no travel budget for this venue. Email your ONE PAGE PDF PROPOSAL to .